We have been around since 1985. So we must have been doing something right! 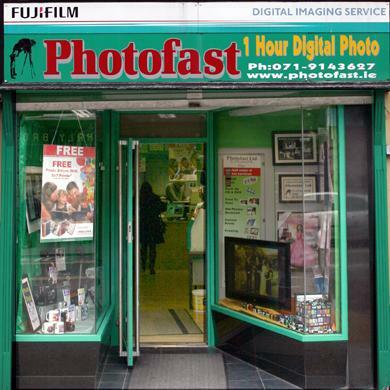 Photofast is a digital and film developing shop in Sligo. We print photos from smartphone and iphone. The print sizes are from small 6x4 size up to 20x30 inch or A1 size posters and all sizes inbetween. We have a range of gifts, like photo mugs, photo cushions, jigsaws, teddy bears,fridge magnets, key rings, photo blocks, canvas prints, collage and montage prints and frames and lots more. We also print party banners, thank you cards, invitations. Our wedding bouquet memory photo charm has been a huge hit with brides to be. It's a great way to remember a loved one on your special day. Photofast has been processing films for years and are still doing it. Film is not dead. We do an online service and get films not only from Ireland, but from all over Europe. That says it all. Photofast started in 1985, providing fast film developing ,wedding and studio photography. After the first year in business, cameras and accessories were add to the range and slowly it grew to be the main supplier of print developing and cameras in Sligo. Along with the shop, the studio and wedding photography went from strength to strength. For example Felim O'Connor LIPPA was the 1st photographer in Ireland to win 7 awards in a row. Felim had covered weddings all over Ireland, from north Donegal to Dublin and every where inbetween. We think the secret of our sucess is our great team. In our shop we provide digital printing and film processing (yes we still do films, it's not dead). We have a large selection of ready made frames and bespoke frames. Cameras, accessories, memory cards and lots more are also available. We have a great wealth of knowledge with our great team.